I can’t remember the last time I was looking forward to a Penn State football game like I am looking forward to this weekend. Maybe 2005? Or 2010 when Joe Paterno won victory #400 over Northwestern? Since the sanctions in 2011, however, PSU football changed. No matter how well they performed on the field, there was no ranking. No polls. Who cares who won the Ohio State-Michigan game? Or if Washington wins? I didn’t even pay much attention to the polls the past five years–until a few weeks ago. Bill bless-his-heart O’Brien made watching the games fun. He might go for it on fourth down on his own twenty yard line. You might be elated by a 4 OT win over the wolverines. But you might witness Penn State’s first and only loss to Indiana in football. I was getting tired of the old argument . . . the sanctions. No depth. Not enough talent. Will take time to get back on top. Anticipation . . . Yet, here we are. Tied at the top in our division. Almost to the Big Ten Championship game. Perhaps even a few lucky breaks away from a bigger prize . . . .
Spartans. Spartans. Spartans. Focus, Todd. The team that really has the conundrum is Michigan State. I may be going out on a limb here, but even despite the ugly Land Grant Trophy that is up for grabs, a win over Penn State this weekend would be bittersweet. The Spartans aren’t going anywhere in the post season regardless. And a Spartan victory would send Michigan or Ohio State to the title game, and possibly a national championship. I may be wrong here, but I doubt Michigan State fans loathe Penn State as much as they loathe their in-state rival, or the long history with Ohio State. If I were a die-hard MSU fan, I might actually root for Penn State this weekend. 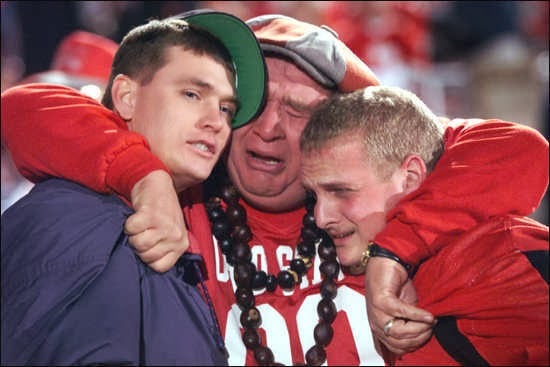 Of course, a Michigan win over the Buckeyes will put a considerable damper on things, but all will not be lost. I almost feel kind of dirty rooting for the Buckeyes. But these are strange times we live in. 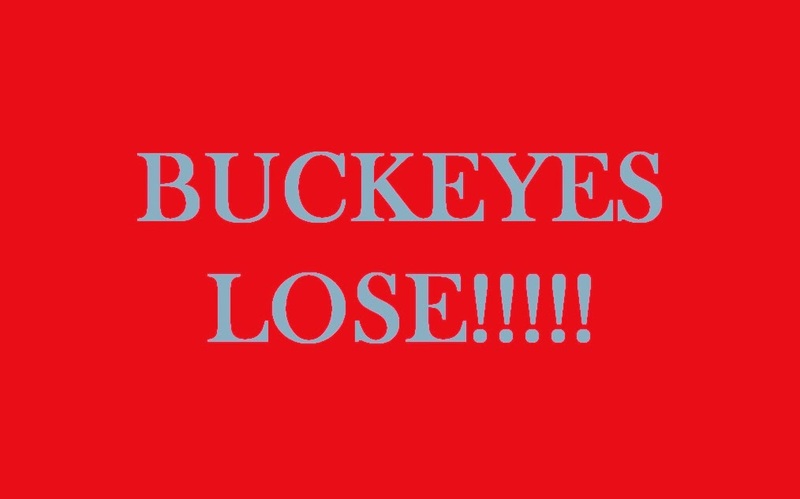 I’m no fan of the wolverines either, and I can enjoy a victory over Harbaugh as much as one over Urban Meyer. In this case, I could really enjoy it. A happy Meyer begets a happy Lion. I know this game was played 2 weeks ago, but I wasn’t blogging then. This was my Facebook post after Penn State upsot THE ohio state university. And beating the Buckeyes and Urban Meyer never grows old. The day started out cold and windy. I ran a 5K race at St. Francis. It was cold. The rest of the day got no better, and by the time we got into the stadium, we were already cold, despite white down jackets and multiple layers. My seats are under the North Upper Deck, so we at least were dry. The pregame sequence included a video that started out with the definition of PANDEMONIUM. Apparently, we were going to cause some, if the media hype was correct. I have searched high and low on the interwebs for a copy of it but my research has yielded nothing. At the time, I thought it was hokey. Even moreso than the constant “UNRIVALED” slogan which after the past four seasons only makes me think UNRAVELED. But the elements for pandemonium were there. We have improved since the debacle in Ann Arbor and the shoot out at Heinz Field. Ohio State, for all the hype and publicity, did not seem to be playing like a second ranked team. Pundits weren’t calling for an upset, but they thought PSU might give O$U a run for their money on this white out night. A good friend of mine asked me before the game, “Do you think we can pull off the upset?” This question has been asked many times in the past 5 years, but there was a tone to his voice to suggest that although he was asking, he thought perhaps an upset could be pulled off. I wish I had jumped on the chance to look like a freaking psychic and say “yes,” without reservation, but instead I waffled like a politician a week before the election. I gave him the “on any given Saturday,” response. I added that I didn’t think the Buckeyes looked sharp in their most recent games. If we played a perfect game and they made a lot of mistakes . . . And we were looking better, albeit against Gophers and Turtles, not wolverines or buckeyes. I could have prematurely prognosticated in public, but I left it at that. Yet, there was a feeling. There was something in the air. There was an electricity in the stadium, that was at the same time feverish and subdued. We wanted to win this game. We could win this game. But we have seen so many failures in the post-Paterno era that we were afraid to let the emotion out of the bottle, lest we look like idiots drinking in the spirits of 1982, 1986, 1994 and 2005 and ignoring the reality of today that stares us in the face. We haven’t beat a top 5 team since 1999 (Arizona.) Seventeen LONG years. We haven’t beat a one or two ranked team since Notre Dame in 1990. Twenty-six LONGER years. Our last recognized national championship was 1986. Thirty years ago. WOW. How could we ever expect to win this game? We were 21 point underdogs. We haven’t beat O$U since 2011. And the first quarter looked good, until we fumbled a punt. We were moving the ball though we failed to convert points. We had already had a field goal blocked on our opening drive–a drive that looked destined for points until it bogged down in Buckeye territory. We could have been up 7-0. We should have been up 3-0. But a blocked field goal left nothing to show for the effort on the scoreboard. Our defense was playing well, and we were holding our own in the field position battle. But here’s where the script deviated from the past five years. Instead of rolling over and playing dead, the defense rose to the occasion and forced a field goal. Down 3-0 in the second quarter to the 2nd ranked team was not anything to be ashamed of. It was a damned moral victory, if nothing else. And even as we fell behind 9-0–the Buckeyes missed a PAT–there was still a chance we could pull this out. The Bucks would tack on another three, before PSU took over with less than two minutes to go in the half. O$U would get the ball back to start the second half and was looking to take a 12 point lead into the locker room. But the offense would have none of that and scored with 9 ticks left on the clock to make a respectable score of 12-7 at the half. The third quarter would be marred by a defensive breakdown that led to a 74 yard rushing TD to make the score 19-7. A second special teams gaffe (snapping the ball over the punters head) led to a safety and a fourteen point margin for the Scarlet and Gray. But then the fourth quarter came, and PSU decided to win this thing. No more mistakes. McSorley scampered the width of the field to make two yards and the pylon and suddenly, the upset-minded Nits were within 7 points. YOU COULD FEEL THE STADIUM COME ALIVE. 107,280 white clad fans (with an unhealthy smattering of red pox marks throughout) rose to the occasion. The defense shut down the Buckeye scoring machine, which heretofor was averaging 49 points per game. Special teams avenged themselves with a field goal after blocking a punt, and then the piece de resistance–a blocked field goal returned for the winning score by Haley. There was still 4 and a half minutes left on the clock. For a team and fanbase that so desperately needed a win, it would seem like an eternity. A field goal by O$U could tie and send us into overtime on this blustery, cold night. A TD would shatter the glass slipper and leave us with nothing but pumpkin juice, mice and a tattered dress. But the defense rose to the occasion, and Penn State took over on downs and knelt a couple of times to run out the clock, just before midnight. We lived happily,pandemoniously, ever after. It’s been awhile since fans had any reason to storm the field. Exhilaration filled the air, and yes, there was relief. We didn’t screw it up after all. I am going to fall short of saying “we are back.” One game does not make a comeback. But it is a damned good start. If we can build on this, then I’ll admit that we are back. But a loss to Purdue, Rutgers or a struggling Michigan State, and the good feeling will be gone. Tonight would become just a fluke. I think having Iowa at night at home should favor us too. Hard to believe, but a lot of fans are now dreaming of a 10-2 season with a nice bowl bid somewhere warm. Which makes a cold Pennsylvania night a little warmer. Urbie’s win streak at THE ohio state went down to MSU and tonight, his undefeated record in BCS games went down as well. Couldn’t happen to a nicer guy and fan base! Of course, Urban showed remarkable restraint in not punching out any Clemson players. Clemson wins the Orange Bowl 40-35 with #5 throwing a pick to seal the deal. Fine job! well played, sir! BEST NIGHT OF THE SEASON!